but only a limited number of videos could be selected. is the theme of the 10th anniversary. This motto is not only related to the type and contents of the audiovisual video works to be selected, but also to the meaning CologneOFF has as an artistic creation of its own. It points to the fact that the festival activities are the creative output of the media artist Wilfried Agricola de Cologne, founding director und curator of CologneOFF whose artistic creative work in form of curating is manifesting itself in that special type of art work, the 10th festival edition of Cologne International Videoart Festival., respectively the totality of the project, entitled CologneOFF – Cologne International Videoart Festival, including 10 editions of an experimental and experimenting festival, and in this way, 10 years of an exciting media development. The festival as an art project and a cultural creation. Agricola de Cologne is placing the particular complex audiovisual creations by the submitting artists in the foreground whose video works follow all the idea of the “Gesamtkunstwerk” using an individual audiovisual language, and in this way, the medium of digital video in all its technological complexity in order to confront the audience with multi-facetted contents, the manifestation of philosophical, political, cultural or artistic statements through a critical view on the PRESENT, sometimes ironically and with a sense of humour, but very serious und profound in artistic concern. 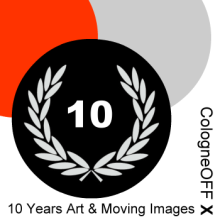 As a unity and totality, the divers selections would like to celebrate the diversity of contemporary artistic creations in times of the merging arts on occasion of the 10th anniversary of CologneOFF.